For other uses, see Pimple (disambiguation). A pimple is a kind of comedo resulting from excess sebum and dead skin cells getting trapped in the pores of the skin. In its aggravated state, it may evolve into a pustule or papules. Pimples can be treated by acne medications, antibiotics, and anti-inflammatories prescribed by a physician, or various over the counter remedies purchased at a pharmacy. Sebaceous glands inside the pore of the skin produce sebum. When the outer layers of skin shed (a natural and continuous process, normally), dead skin and oily sebum left behind may bond together and form a blockage of the sebaceous gland at the base of the skin. This is most common when the skin becomes thicker at puberty. The sebaceous gland continues to produce sebum, which builds up behind the blockage, allowing bacteria to grow in the area, including the species Staphylococcus aureus and Propionibacterium acnes, which causes inflammation and infection. Some more severe pimples can lead to significant swelling and may appear on the back and chest. Common over-the-counter medications for pimples are benzoyl peroxide, salicylic acid, and antibacterial agents such as triclosan. These topical medications, which can be found in many creams and gels used to treat acne (acne vulgaris), induce skin to slough off more easily, helping to remove bacteria faster. Before application, the face should be washed with warm water or a topical cleanser and then dried. Acne rosacea is not caused by bacterial infection. It is commonly treated with tretinoin. A regimen of keeping the affected skin area clean plus the regular application of these topical medications is usually enough to keep acne under control, if not at bay altogether. The most common product is a topical treatment of benzoyl peroxide, which has minimal risk apart from minor skin irritation that may present similar as a mild allergy. Recently nicotinamide (vitamin B3), applied topically, has been shown to be more effective in treatment of pimples than antibiotics such as clindamycin. Nicotinamide is not an antibiotic and has no side effects typically associated with antibiotics. It has the added advantage of reducing skin hyperpigmentation which results in pimple scars. 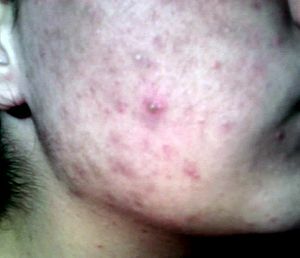 Severe acne usually indicates the necessity of prescription medication to treat the pimples. Prescription medications used to treat acne and pimples include isotretinoin, which is a retinoid. Historically, antibiotics such as tetracyclines and erythromycin were prescribed. While they were more effective than topical applications of benzoyl peroxide, the bacteria eventually grew resistant to the antibiotics and the treatments became less and less effective. Also, antibiotics had more side effects than topical applications, such as stomach cramps and severe discoloration of teeth. Common antibiotics prescribed as of 2001 by dermatologists included doxycycline and minocycline. For more severe cases of acne dermatologists might recommend accutane, a retinoid that is the most potent of acne treatments. However, accutane can cause various side effects including vomiting, diarrhea, and birth defects if taken during pregnancy. Expression, the manual bursting of pimples which have evolved into whiteheads with one's fingers, can allow bacteria to be introduced into the open wound this creates. This can result in infection and permanent scarring. Thus expression is generally recommended against by dermatologists and estheticians in favor of allowing pimples to run through their natural lifespans. ^ Anderson, Laurence. 2006. Looking Good, the Australian guide to skin care, cosmetic medicine and cosmetic surgery. AMPCo. Sydney. ISBN 0-85557-044-X. ^ Siegle, R. J.; Fekety, R.; Sarbone, P. D.; Finch, R. N.; Deery, H. G.; Voorhees, J. J. (1986). "Effects of topical clindamycin on intestinal microflora in patients with acne". Journal of the American Academy of Dermatology. 15 (2): 180–185. doi:10.1016/S0190-9622(86)70153-9. PMID 2943760. ^ Handfield-Jones, S.; Jones, S.; Peachey, R. (1988). "High dose nicotinamide in the treatment of necrobiosis lipoidica". British Journal of Dermatology. 118 (5): 693–696. doi:10.1111/j.1365-2133.1988.tb02572.x. PMID 2969260. ^ Morrison, A.; O'Loughlin, S.; Powell, F. C. (2001). "Suspected skin malignancy: A comparison of diagnoses of family practitioners and dermatologists in 493 patients". International Journal of Dermatology. 40 (2): 104–107. doi:10.1046/j.1365-4362.2001.01159.x. PMID 11328390. ^ "What to Know Before You Pop a Pimple". WebMD. Retrieved 3 April 2017. ^ "The 10 Most Satisfying Pimple Popping Videos Of 2016". Men's Health. 29 December 2016. Retrieved 3 April 2017. ^ "Should I Pop My Pimple?". kidshealth.org. Retrieved 3 April 2017. ^ Merlin, Design: Wolfgang (www.1-2-3-4.info) / Modified:. "A14. What should I do after popping a pimple? | Skinacea.com". www.skinacea.com. Retrieved 3 April 2017. ^ "How to Pop a Pimple - Instructions from Acne.org". www.acne.org. Retrieved 3 April 2017.